Amazon Music Unlimited is a new music streaming service by Amazon that the company pits against established services such as Spotify and Apple Music. While it shares similarities with those services, it is offering something unique as well. For instance, instead of offering just one tiered pricing, Amazon Music Unlimited is available in three different price categories. While that sounds confusing at first, it may get even more confusing considering that Amazon is already operating a music streaming service called Prime Music. Lets take a closer look at the service for starters. Amazon's Music Unlimited service starts at $3.99 per month for Amazon Echo, Echo Dot or Amazon Tap device owners. That's undercutting competing streaming services by a large margin, but is restricted to that single device. This means no mobile or web access, just access through the one Amazon device. The regular plan is available for $9.99, which other streaming services charge as well. Amazon Prime members may get it for $7.99 instead per month. The Prime member plan is also available for $79 per year. Additionally, Amazon plans to launch a family plan for $14.99 per month which provides access to the full streaming service for up to six family members. The price matches the family price plans of Spotify and Apple Music. The price point of $7.99 per month or $79 per year looks good on paper on first glance. But it applies only to Prime members who pay Amazon for the subscription already. In the US, Prime costs $99 per year which means that Prime members would have to shell out nearly the same amount to add Music Unlimited to their plan (or $20 less if they pay yearly). Considering that Prime Music is included with a Prime membership, one has to wonder if the service is worth the extra costs. If you compare Prime Music to Music Unlimited, you will notice that the former offers access to about 2 million songs while the latter to "tens of millions of songs". Music Unlimited users get access to a new app, curated playlists, and artist commentaries on top of that. Is that worth the extra costs? Depends largely on whether you are satisfied with Prime Music. If music that you like to listen to is missing, you might be tempted to give Music Unlimited a try. 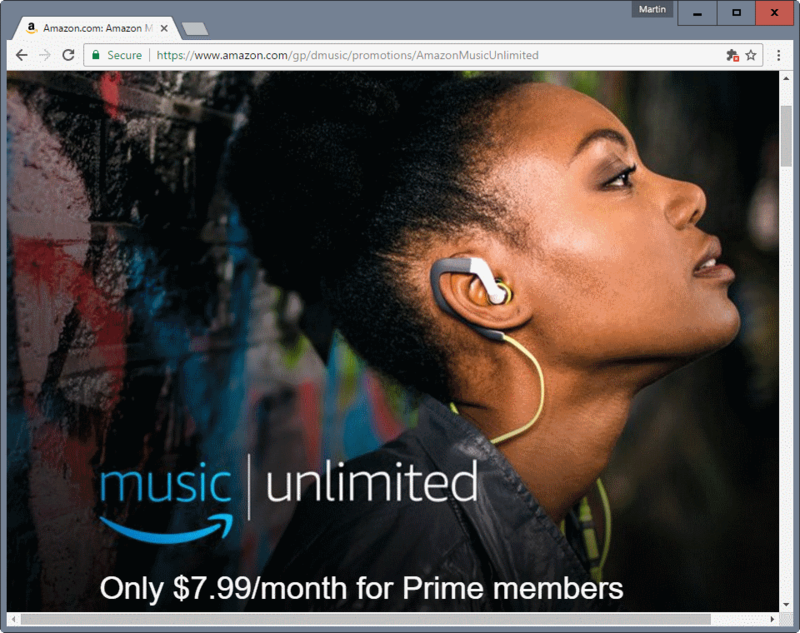 Considering that the pricing is better than that of Spotify or Apple Music, Amazon Prime customers who are customers of these services may be tempted to leave those services in favor of Amazon Music Unlimited. The $3.99 per month price for Echo owners looks fabulous on paper, but it has the caveat that it works only on a single device. If you don't require music streaming on the go, on your smartphone or computer, and have an Echo at home, then you may find the offer attractive because of its price. Amazon Music Unlimited is controlled by voice on Echo devices which means that you can ask Echo to play certain songs, songs by artists, but also by mood, occasion or anything else you may come up with (Echo, play cheesy 80s television shows theme songs). Amazon has deep enough pockets to stay long enough in the music streaming vertical to make Music Unlimited a success. Considering that it can push the service through its Amazon site and other properties, it will certainly grab a sizeable share of the market right from the get go. Now You: Do you use music streaming services? I use Guayadeque music player. I’m always finding new songs and stations. Love it and it is free. I’m a Prime member. Music is one reason, but there are also books and shipping and video and several other “included” features that benefit members. One could view music as a “free” benefit (no additional cost anyway); it’s good for people who just want something to listen to. Music Unlimited, however, is for people who have specific artists and tracks that they want to listen to–a lot. $80/yr is a good price for that compared to the other services. The Echo plan is for those who already rely on the Echo anyway, or those who could. It’s certainly not likely to steal anyone away from the regular plan(s) on price alone (you’d still have to buy the Echo and limit your listening location–which is fine for some but not for others). To each his/her own. I’m sure it suits Amazon fine–one more reason (opportunity to save, well, spend less for something) to join Prime. As usual, if it’s something you want, then you can probably find it for less at Amazon. And if it’s not something you want, then you probably didn’t need it anyway. Seems like Amazon is one step away from Launching Amazon Prime Prime – a better service for more money. I’m giving it a free trial at least. I like it so far, as someone who likes to listen to brand new music, often by more obscure artists, Prime music was sadly lacking in this department. So far the Amazon Music Unlimited service has been pretty decent. I’ll give it the full 30 days and decide from there. The one critique that I have so far is that in terms of app usability, Amazon’s Music app is woefully behind the more polished Spotify and even Google Play Music. They need to fix that ASAP if they want to be a truly major player in music streaming. I’m also curious if they will eventually offer a student discount similar to what they offer students with Prime and what Apple, Spotify, and Tidal all offer for their services.